I’ve always been a fan of sharing openly. I sometimes tell people that my life is an open book that no one wants to read. The nature of my job and my position is one that interacts regularly with social media as both a way of learning and a means of sharing. Recently, I’ve been captivated by the phenomena of Meerkat and Periscope. As I’ve seen throughout my many years in Ed Tech, whenever a new tool hits the market there are usually a slew of early adopters running out to grab it, figure out what it does, then figure out how we can use it for education. I’m usually one of those first-adopters, but I’ve purposefully taken a more measured approach to the world of mobile live video streaming and becoming a “Digital Broadcaster”. I have been to countless presentations where people have stood up during a certain slide to snap a photo of an amazing graphic or quote. I’ve also seen people take photos of the presenter on stage with a poignant slide in the background. I’m lucky enough to be able to present and entertain educators from all over the country and have no problem sharing my slides, my resources, and the occasional selfie. When is it ok to live stream someone without permission? At a recent event this summer, I was in the middle of a presentation and noticed someone standing off to the side with their phone in vertical video mode (which itself is annoying). When I asked the attendee what she was doing she told me she was “periscoping” my entire talk. Figuring that this is sort of a new tool and I think it’s important that everyone has access to learning, I dismissed the lack of permission in this instance for the betterment of education. However, that moment stuck with me and when thinking about the protocols for filming someone’s talk, I tried to relate to the music and film industry. They have some pretty clear guidelines about when it’s ok or not ok to film. Despite these guidelines, if you go to any rock concert you’ll see tons of phones up and recording video. (presumably for personal use although many of these are texted and posted on social media) When thinking of recording movies, I’m reminded of the Brody and the “Death Blow Bootleg” episode of Seinfeld. I’m not saying this crosses into the “bootlegging” realm, but there are some similarities in the narrative of when is it ok and not ok to record an event without permission. Where do we draw the line between sharing and permission? It’s a question that’s been churning in my brain for the last few weeks. Since I don’t want to be someone that bashes a tool without trying it, I created my Periscope account and actually streamed a minute of the closing keynote that afternoon (the appropriately titled, “SHARE, it’s human” by Felix Jacomino). I have to admit, it’s a pretty cool concept. You record an event happening that you want to share with your followers (but not necessarily archive) and BOOM! It’s instantly out there with no tape delay or filter. Eric Sheninger recently wrote this post on the power of video in schools where he dissects the various video tools out there and some resources for how they can be used in schools. 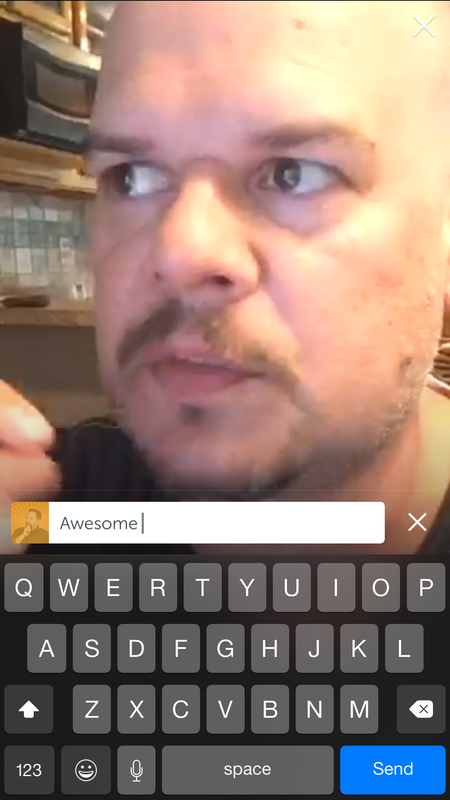 Tony Vincent also shared a great post of how he utilized Periscope at ISTE 2015. While I think the digital broadcasting movement has a lot of potential, let me go back to the original question: When is it ok to live stream someone without permission? While it’s great to watch an entire presentation and not actually be there, many events and speakers actually have contracts written that state who can and can’t record. We deal with this often with our keynote speakers at iPadpalooza. Most contracts allow for internal use of video, but not external (especially not the entire talk). Looking at YouTube and their guide to “fair use” I like their set of “4 questions to ask”. The fourth question “Will you work serve as a substitute for the original” is where filming presentations may cause trouble. Solution: Ask for permission prior to capturing any part of a talk but ESPECIALLY if you are planning on streaming the entire talk. As I stated before, there seems to be some social norms that make it ok to take photos of poignant slides. While this could potentially be a copyright violation, most presenters share their slides and materials so that others may learn from them. As a presenter it not only spreads the message, it drives interest in who the speaker is and the message they are trying to convey. The same can be said about Periscoping someone’s talk in that sharing a snippet of someones talk allows the end-user to experience a bit of what the audience is seeing, almost like a sneak preview. The question is when do you cross the line between a sneak preview and recording an entire talk. Solution: If you are going to capture someone’s talk or presentation, keep it to under 1-2 minutes. This way those you share with will get to see some of the amazing things shared without sharing a “substitute for the original”. Live-streaming someone in a public place means that bystanders around the recording device may be captured. While holding up your phone may give them the clue that you are in fact recording, they may not be as aware when it comes to their own under-the-breath comments. 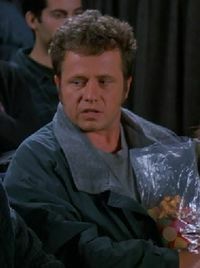 A snarky remark shared lived by someone in the audience is instantly playable to everyone in the world even if it was only intended for their neighbor. Solution: Let those around you know you are capturing the talk (and warn them what they say may be inadvertently captured) or move to a more isolated location to capture the brief recording. 4. Live Stream vs. Capture? With both Meerkat and Periscope, there are time limits to how long the videos are posted. Which means that only a few will get the opportunity to see it if they are following along. Capturing and editing a video to put onto YouTube or some other platform is done with the intent of sharing over the course of time. Solution: If you are just sharing a snippet of a talk or presentation to share where you are and what you are watching with friends, stick to Meerkat or Periscope. However, if you are hoping to capture the entire talk for distribution elsewhere, you’ll want to do so with permission from the speaker. If you are at a large event like ISTE or a smaller conference, it’s likely that all featured speakers have some sort of exclusivity clause with the event organizers. Filming without permission of the event, could result in getting you thrown out. Solution: Find the organizers of the event and ask for permission. While that may seem cumbersome, it’s possible that the event will give you access to their own stream or even ask you to post it to their social media feed for cross-promotion. At worse they will tell you “No” and you’ll be able to sit back and enjoy the talk while it’s being captured by someone else. So there you have it. Nothing too Earth-shattering but I’m hoping we can start to have the conversation around this topic of digital broadcasting. I think it’s important that we have this conversation with colleagues and students around the rules above to determine what is right and what isn’t. Let’s figure out this dilemma before people start using the voyeurism prevention act and give talks while disrobing. No one wants to see that!! Update: Literally 10 minutes after making this post I got to experience a “private Periscope” with Felix. He shared some thoughts on a workshop he was giving and some other ideas he had. I can definitely see some educational benefits to that! Thanks for sharing Felix! A screen shot of my Video-to-text conversation with Felix and this post. Appropriately done on Periscope! 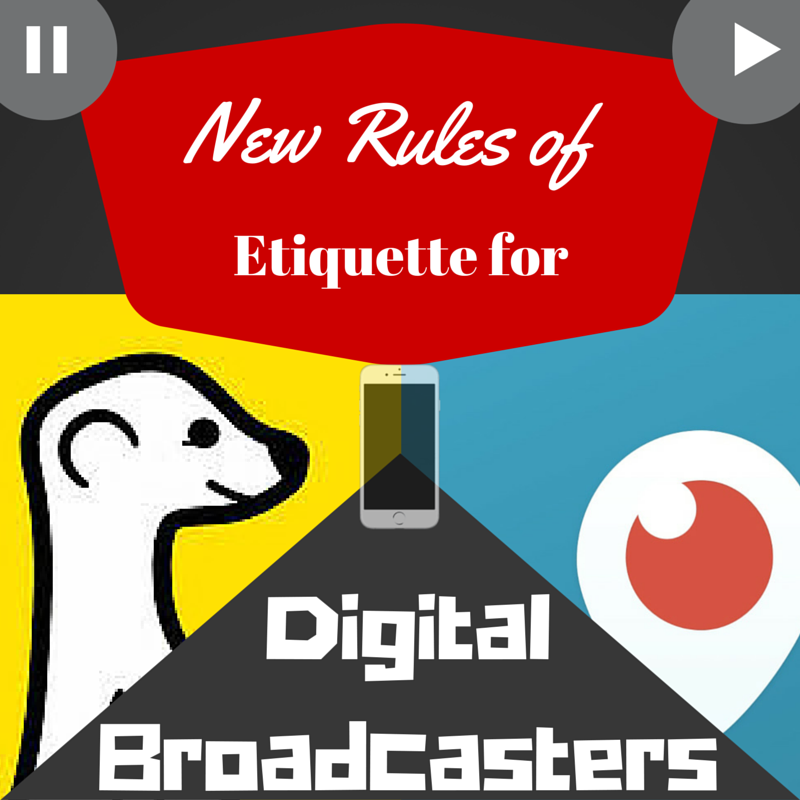 Posted on August 3, 2015, in Apps, Innovation, Instructions, Social Media and tagged bootleg, digital, digital broadcasters, etiquette, event, laws, legal, live streaming, meerkat, periscope, presentation, public, rules, share, social media, speaker, talk. Bookmark the permalink. 7 Comments. Never assume, right? Mea culpa. I watched the iPadpalooza STX keynote from the comfort of my home in MN. I assumed both keynoters had given permission for the live stream. In watching live Periscope streams from ISTE 15 and a few other conferences this summer, I have to admit I experienced some level of discomfort and a sense of guilt at being part of Periscope streams where organizers and live participants had paid for being a part of that learning experience, not to mention all the hard work and months of preparation on the part of the organizers and speakers. Thank you for putting this out there. I look forward to some lively discussion. Thanks Kathleen. I can certainly see EdCamps using these in powerful ways. Paid events generally try and control the live stream channel. Like we have a free live stream for iPadpalooza but we ask the speakers for permission prior to posting. Generally, we don’t post the keynotes. Great discussion and hope you enjoyed the keynote! No need to apologize! I watched and thoroughly enjoyed the keynote by you and Todd. 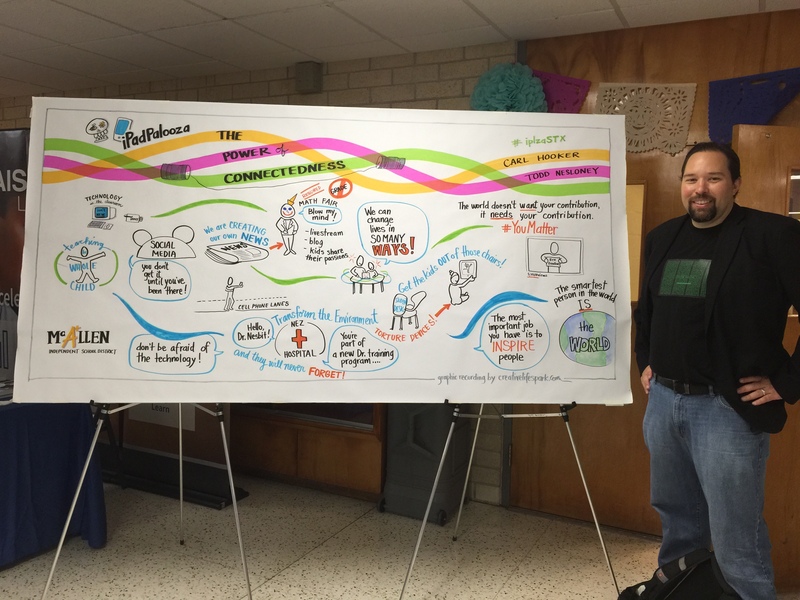 The sketchnoting was really intriguing. I’ve seen others this summer, too. I love the learning I’ve been able to access from the comfort of my home. However, I have felt guilty because I have not paid one cent, and that doesn’t feel fair. (Not guilty enought to stop, however!) It will be interesting to see how this plays out. Your protocols seem like a good starting point. They are just that..a starting point. I think the classroom or an assembly or even a school play could each have different protocols. Curious to see how this plays out in the next few months. Great post! Thanks for writing this. The other things that concerns me is that some people act as if they have just been given their own tv station. While I know that I have the power to just not watch what they are streaming. I can’t help but think – Do they think this is really adding to the conversation or has value? Maybe it is just me. My kids and I just watched both someone at Disneyland (peri scoping the Its a Small World ride) and someone at Disneyworld (periscoping the closing fireworks). It made me think that this could hold real potential at the Olympics next summer because people could bring us their view point of a sporting event. It’s still not as nice as the NBC cameras but somewhat unique, more intimate, and almost more real in a sense because it’s like you holding up your phone and recording. This could have a serious psychological impact on people in the sense that you experience events like you are there but aren’t really there.